Hello and a happy Thursday to you! 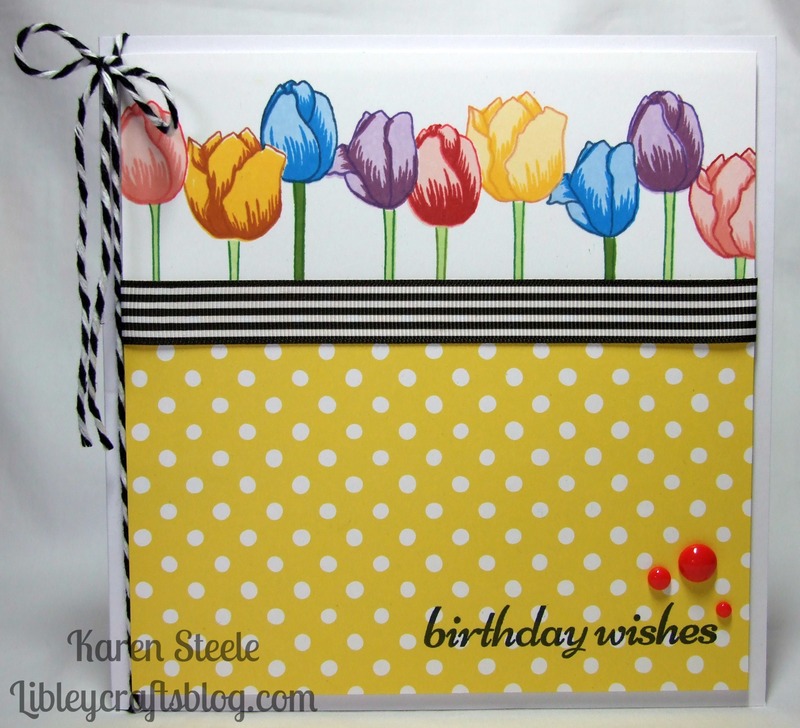 Today’s card has been made using Altenew’s Tulip set. Now, I’m not the fastest stamper – especially when I’m using layering stamps! so considering that this is a 7×7 card, you might be able to imagine how long it took me to stamp the tulips!! It took 45 stamps to complete the tulip border (5 different stamps for each of the 9 flowers). I won’t say how long it took me, but it gave me a bad back afterwards! Anyway, I really liked how it turned out – good job really! I should explain that I have to craft standing – hence the back pain! To make this I also used: DP – Polka in the Meadow – Lawn Fawn, Striped ribbon and twine, Bella & Boo Enamel Dots, the MISTI, and the following Memento inkpads; Tuxedo Black, Bahama Blue, Summer Sky, Nautical Blue, Cottage Ivy, Bamboo Leaves, New Sprout, Sweet Plum, Lulu Lavender, Grape Jelly and also Altenew inks – Summer Afternoon and Red Sunset. Oh, those tulips are beautiful! I always look forward every year to seeing my yellow tulips bloom! Your card is so pretty and colorful!! But it is the cheeriest card I have seen for some time, so hopefully worth the effort?! The yellow makes a great contrast for the multi-coloured flowers and the black and white striped ribbon is a personal favourite. Gorgeous. Thank you Gill! I was pleased how it turned out in the end so I guess it was worth a bit of backache! Just maybe you wouldn’t offer to make a boxed set, right?! Lol! Definitely not 7×7’s anyway! Beautiful card, Karen! Love the tulips and polka dots! 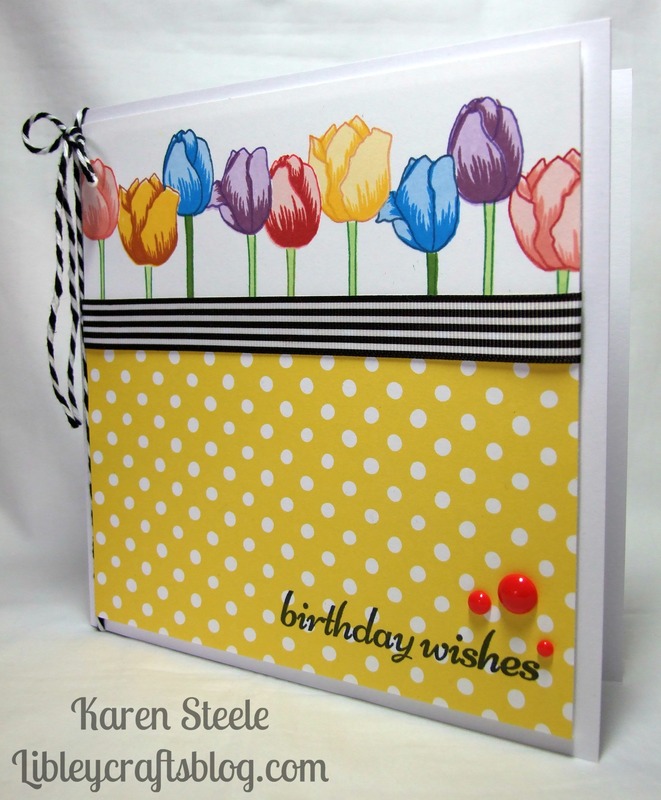 FUN Color Palette and beautiful Card, Karen ! Wow, 45 stamps and lots of different colored inks. This sure was no 10 minute card but I love how it turned out, so worth your struggles and back pain!